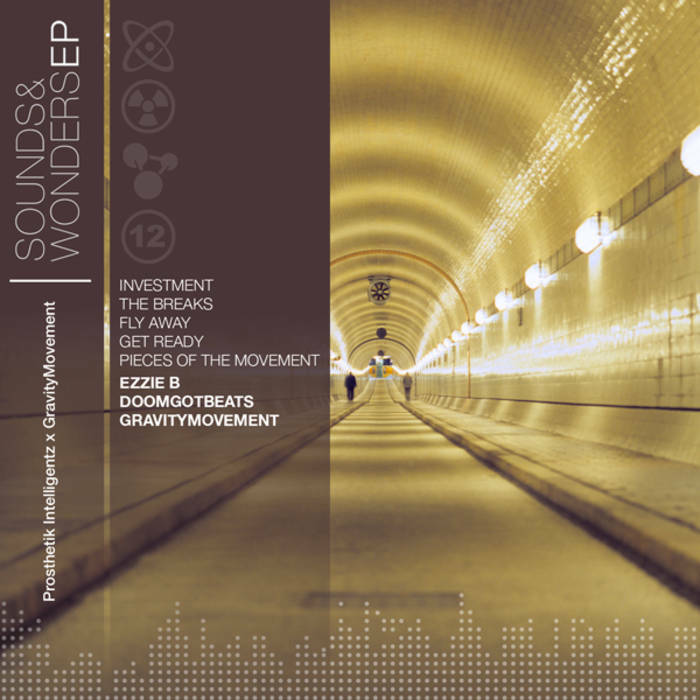 Shift your mind into fifth gear with Prosthetik Intelligentz and Gravity Movement’s The Sounds & Wonders EP. Formed in Fayetteville, North Carolina in April 2010, Prosthetik Intelligentz is an independent hip-hop duo consisting of Bryson “B. Doom” Dumas and Ezra “Ezzie B.” Baptiste. After meeting and realizing their passion for authentic music, the duo started to create the Man-Cave Music Mixtape series. The first instalment produced a lot of buzz on the underground music scene, while the second instalment showcased collaborations with Erik “Depakote” Lopez, an independent Garden Grove California producer. After touring and promoting both mixtapes, the duo stumbled upon Raleigh, North California-based producer Eric “Gravity Movement” Bannister. The three paired up resulting in this 8-track EP released last December 12, 2011. Intro track Sunlight opens with a revolutionizing aesthetic. An excerpt from Charlie Chaplin’s “The Great Dictator” is played while soothing grooves on the background maintain a steady vibe. Investment honours Professor Cornel West by blending some of his well-loved lines to potent rap verses. The artists succeeded in creating a track where classic style perfectly mashes with unpretentious Hip Hop music. Fluttering down with much soul, Fly Away spreads buckets of carefree and positive vibes. Get Ready, on the other hand, traverses an edgier approach. Impressive rapping skills and healthy doses of hooking beats create a soundtrack for the listener’s thoughts. Pieces of The Movement showcase Ezzie B.’s impeccable rapping punctuated with lo-fi and soothing harmonies. This solid track clearly establishes Prosthetik Intelligentz’ distinct musical palette. Bonus track Mic Check offers a sneak peak on their brewing free project entitled The Lo-Fi Experiment. It’s a collaboration between Fayetteville, North California-based producer R8der and Prosthetik Intelligentz very own Hip-Hopper Ezzie B. The World Is Bond and The Wonderful World of Carminelitta will be sponsoring and heading up the distribution of this album’s free physical copies. As an added treat for fans, the cover art for their new album is included in this download. Also another bonus track, SupercalifragilisticexpialaDOPESHIT is a pleasant surprise. It’s part of the duo’s Man-Cave Mixtape Compilation which was also featured on FrostWire. This refreshing track cleverly blends Hip Hop and wordplay in a way that solicits both passion and head nodding. All in all, Prosthetik Intelligentz creates good for ear beats that is teeming with substance. The Sound & Wonders EP reflects the artists’ tireless determination, resilience, and strong work ethic to encapsulate unpretentious Hip Hop into a whole listening experience.